Teacher education programs are principally charged with the task of preparing preservice teachers before they enter a profession that increasingly requires awareness of diversity and inclusion (Badiee & Kaufman, 2014, 2015; Girod & Girod, 2008; Rayner & Fluck, 2014; Zibit & Gibson, 2005), critical thinking, team-building, professional identity, and self-efficacy (Bautista & Boone, 2015; Carrington, Kervin, & Ferry, 2011; Sottile & Brozik, 2004). Unfortunately, the field experiences of preservice teachers that lead up to entry into the profession are often fragmented in a variety of university courses that provide decontextualized experiences within teacher education programs (Carrington et al., 2011). Such experiences may leave teacher candidates feeling unprepared to assume their teaching duties inside and outside of the classroom. This problem was noted by Darling-Hammond and Sykes (2003) as an important variable in the attrition rate of new teachers within those crucial first 3-5 years in the profession (Zibit & Gibson, 2005). Compounding the problem is that those fragmented experiences tend to be high stakes (Girod & Girod, 2008), in the sense that preservice teachers are constantly evaluated by cooperating teachers and university supervisors, often with guidelines and checklists mandated by school districts and university internship seminars. Such evaluation tools may also discourage experimentation to resolve critical incidents with students, families, colleagues, and K-12 administrators. In such a heavily prescribed and monitored environment, opportunities for do-overs are not often available to preservice teachers if they wish to handle situations differently. Furthermore, preservice teachers do not get opportunities before their internship to experiment repetitively in realistic situations in which they are encouraged to problem-solve collaboratively in relatively consequence-free environments (Badiee & Kaufman, 2014). To allow preservice teachers the opportunities to experiment in lower stakes environments before assuming full-time duties in the classroom, classroom simulations have been created and adopted by many teacher education programs worldwide. Such simulations can range from primarily text-based to virtual reality (Gibson, Aldrich, & Prensky, 2007). As creators of simSchool noted in their rationale for the creation of their classroom simulation (Zibit & Gibson, 2005), simulations provide learning opportunities similar to pilots in aviation simulators, in that both can provide a sense of realism without the potential consequences to real stakeholders should ill-advised decisions be made. Badiee and Kaufman (2014) asserted that simulation classrooms “could provide repetitive experimentation, practice and feedback cycles that would not be possible in classrooms and that avoid the dangers associated with mistakes made on actual students” (p. 182). Thus, there is a need to create a simulated curricular experience for preservice teachers that allows unified, contextualized experiences in a low-stakes environment to encourage experimentation and collaboration. In addition to creating experiences in which preservice teachers can experiment and collaborate without fear of failure or adverse consequences, there is a need to create learning experiences that also reflect the changing demographics of K-12 classrooms as they evolve toward greater diversity, including a shift toward minority-majority schools in 2014-2015 for the first time (National Center for Education Statistics, 2013). A simulation that specifically addresses diversity within a K-12 environment could accomplish this. However, studies that use K-12 classroom simulations generally do not focus on diversity, although the simulations used in the studies may have elements that address culture, language proficiency, and learning disabilities. One exception to this would be Rayner and Fluck (2014), who addressed diversity using a simulation to inculcate awareness of students with disabilities. In general, however, previous studies tended to focus on teacher work samples (Girod & Girod, 2008) and classroom management and instruction (Badiee & Kaufman, 2014; Carrington et al., 2011). Therefore, a study which uses a classroom simulation with diversity as its principal focus would be a welcome addition to previous research in building a reflective practice for undergraduate preservice teachers. To meet the needs of teacher education programs there are both commercially available simulations, such as simSchool (Gibson, 2007; Zibit & Gibson, 2005), and in-house, locally developed simulations, such as ClassSim (Kervin, Ferry & Carrington, 2006), Cook School District (Girod & Girod, 2008) and TeachME (Bautista & Boone, 2015). There are advantages and disadvantages to both commercial and in-house products. Although generally more engaging with the gamer generation, commercial simulations may be limited with respect to the number of simultaneous users allowed (Rayner & Fluck, 2014), the cost associated with licensing the products, and flexibility in adding content such as custom scenarios. In-house simulations, while sometimes lacking that game-like edge of a more polished commercial product, allow custom content to be added or incorporated. In addition, it is possible for the creators of in-house simulations to retain local control of the simulation to meet the needs of a specific teacher education program. In order to improve the reflective practice of preservice teachers before they enter their internships and the teaching profession, a team of education faculty members at a large, private, not-for-profit university in the southeastern United States opted to create an in-house simulation to enhance teacher candidate awareness of real world situations involving diversity they may encounter as future teachers. The design and development of the simulation was a collaborative 3-year effort between the university and two international companies, Tata Interactive Systems and TOPSIM. TOPSIM was responsible for the overall custom simulation design, Tata provided all the programming and web development, and 10 full-time education faculty members were responsible for the content. A special budget of approximately $100,000 was allocated by the university to support the creation of this simulation. In the first year of development, the university faculty members developed the content for the simulation. In the second year, TOPSIM developed the working beta model, and Tata provided programming and other technological support. Faculty training on the simulation was initiated at the end of the second development year. The simulation was pilot tested in the middle of the third year of the project with 18 students, and the feedback was overwhelmingly positive. At the end of the third development year, the simulation went live with the first 60 undergraduate students enrolled in the course. A major goal of this simulation was to encourage group and self-reflection through problem-based learning as the participants evaluated and intervened in a series of six scenarios involving realistic critical incidents demanding their immediate attention as teachers, parents, and administrative staff. The simulation (see Figure 1) had the theme of diversity running throughout the fabric of various authentic scenarios, some inspired by the headlines of recent years. The simulation provided preservice teachers the opportunity for collaboration within a safe and low-stakes environment while promoting higher order thinking. The simulation also provided the opportunity to debate interventions, as well as create alternative solutions not envisioned by faculty developers of the simulation. Furthermore, the simulation allowed preservice teachers to make suggestions to improve the simulation for future preservice teachers through reflections and anonymous surveys. Figure 1. Screenshot example illustrating diversity. In this study of an online diversity simulation, we examined how undergraduate preservice teachers interacted with the simulation and with one another in teams to ascertain their opinions about the simulation as a preparation tool for future teachers. In addition, we compared qualitative themes that emerged from feedback to see if they were consistent with previous research on simulations in education. What are preservice teachers’ opinions about the diversity simulation experience as a preparation tool for future teachers? To what extent are preservice teachers’ reflections consistent with previous research on teacher education simulations (after completing the diversity simulation experience)? Simulations and game-based learning environments have been used in various fields of education such as science education (Barab & Dede, 2006; Rutten, van Joolingen, & van der Veen, 2012), art education (Lu, 2011), physical education (Lin & Zhang, 2011), social studies education (Ioannou et al., 2006; Yukhymenko, 2011), elementary and secondary science education (Burton et al., 2011; Sottile & Brozik, 2004), early childhood education (Bautista & Boone, 2015) and diversity education (Bachen, Hernandez-Ramos & Raphael, 2012; Inglis et al., 2004; Simkins & Steinkuehler, 2008). In a review of research on computer simulations and science education and other closely related science, technology, education, and mathematics (STEM) fields, Rutten et al. (2012) examined 48 empirical studies that focused on the use of computer simulations aimed at changing knowledge or skills of high school and undergraduate students. The results of the review of all the studies indicated that simulations are “robust additions to the repertoire of teachers, either as an addition to available traditional teaching methods or as a replacement of parts of the curriculum” (p. 151). Furthermore, positive results were commonplace across studies for motivation, attitude, and viewing of the simulation as a prelab training for real-lab activities, not unlike a diversity simulation with realistic school scenarios as preparation for real-life teaching. Several researchers caution, however, that simulations should not be completely controlled by the instructor (Lindgren & Schwarz, 2009; Rutten et al., 2012; Windschitl & Andre, 1998). Their research further suggests that simulation users should have opportunities to create and evaluate their hypotheses and possible courses of action within well-defined scenarios and contexts. As simulation scenarios tend to be complex and realistic (Barab & Dede, 2006), Rosenbaum, Klopfer, and Perry (2007) explained that students “should be able to work with incomplete information, adapt to changing conditions, manage complexity and fluidly create and share knowledge” (p. 32). These findings suggest that for a diversity simulation, preservice teachers should have a fair degree of autonomy and involvement in the simulation. A simulation should be offered at a time when preservice teachers can best make use of their previous training and explore and test their hypotheses in diversity scenarios that are contextualized. As noted, simulations have a number of positive benefits in the teaching of content areas to undergraduate students, in general. For teacher education, in particular, several virtues make simulations particularly well suited for preservice teachers. Many preservice teachers are digital natives and would naturally expect technological innovations in their education programs. For example, Zibit and Gibson (2005), Girod and Girod (2008), Archambault, Wetzel, Foulger, and Williams (2010), Schrader, Archambault, and Oh-Young (2011), Rayner and Fluck (2014) and Badiee and Kaufman (2014) argued that teacher education programs need to employ technological innovations such as simulations to better prepare teachers for 21st-century classrooms, as well as for teaching technologically proficient students with whom they will be working. In their discussion on the creation of the simSchool simulation, Zibit and Gibson (2005) noted that teacher education simulations would be akin to flight simulators in allowing students through innovative technology to immerse themselves in the complexities of teaching students. Further, if constructed well, simulations allow users to step outside the normal boundaries of thinking and consider multiple complex possibilities and scenarios that do not always have right or wrong answers. Another benefit of simulations is that they allow users to see direct connections between what they are learning and the real world (Badiee & Kaufman, 2014). The more realistic the simulation, the more interesting it would be to digital natives who are plugged into a constant stream of information through their digital devices. Additionally, the less a simulation resembles schoolwork and the more control preservice teachers have over the simulation, the more the simulation would feel like authentic learning outside of the classroom (Badiee & Kaufman, 2014; Carrington et al., 2011; Girod & Girod, 2008). Finally, simulations allow users to gain precious confidence in decision-making in situations that are complicated and generally require a collaborative approach to resolve (Inglis et al., 2004). When preparing preservice teachers for situations that might arise before they take over a classroom in a student-teaching internship and later their own classrooms, these benefits should be taken into consideration. In addition to greater self-confidence reported for preservice teachers while using innovative technology, simulations also have a further benefit of promoting professional identity and self-efficacy. Sottile and Brozik (2004) found that simulations have great potential for use in teacher education for the promotion of team building, critical thinking, and self-efficacy. Bautista and Boone (2015) discovered that high self-efficacy is linked to desirable teacher actions and increased student achievement. Burton et al. (2011) found that both their quantitative and qualitative data indicated a high level of self-efficacy among the preservice teachers regarding simulation use and problem solving in a science methods class in an elementary education program. Further, Carrington et al. (2011) learned that simulations allowed preservice teachers the opportunity to make connections between theory from their program coursework and practical experiences they gleaned from their field experiences to make decisions confidently. Their results also suggested that teacher candidate users of an “online simulation may be better equipped to transfer the knowledge and skills they acquired during their training to a real life situation” (p. 366). Of particular interest is the notion that the emerging professional identity of preservice teachers could be enhanced through inclusion of relevant professional scenarios, materials, and support during the simulation in addition to the incorporation of a space for personal reflection and growth. Mason, Glomb, and Blair (2012) examined how promotion of professional identity and self-efficacy among preservice teachers in realistic scenarios could be accomplished through virtual learning environments in simulated individualized education plan (IEP) meetings. The researchers found that virtual IEP scenarios allowed preservice teachers of various backgrounds and locations to connect with one another to solve problems, despite the fact that they were participating in a distance teacher-education program. What bound them together was a sense of collaboration, growing professional identity, and greater self-efficacy in working with parents in future complex situations. Although their research was geared more toward diversity education and empathy in a general education class, Inglis et al. (2004) provided a model that was used in this study for assessing the experiences of undergraduate students in a diversity simulation. Similar to their study, we used a 5-point Likert-type scale to rate the quality of the experience using a cultural simulation. Additionally, both the Inglis et al. study and the current study incorporated a summative written reflection about the simulation. Expanding this model, we included written reflections throughout the diversity simulation to increase student engagement with the simulation. Similar to the Inglis et al. study, we also utilized oral reflections as part of the simulation each week as opposed to the single oral debriefing. Finally, this study builds upon previous research that found classroom simulations promote elements of reflective practice in the teaching profession such as professional identity, self-efficacy, critical thinking, and empathy (Bautista & Boone, 2015; Burton et al., 2011; Carrington et al., 2011; Mason et al., 2012; Sottile & Brozik, 2004). A total of 193 undergraduate teacher education majors (preservice teachers) participated in this study, which was embedded in an online diversity simulation. The course is a requirement within a 4-year undergraduate teacher education program within a large, private, not-for-profit university in the southeastern United States. The demographics of the university allow it to be classified as a minority-majority institution. The online diversity simulation is taught by full-time faculty members who were involved in its development. This is one of the final courses preservice teachers are required to take prior to internship. The entire simulation experience was based on profiles of K-12 students who were created solely for use in the simulation; thus, preservice teachers were not asked to correspond with anyone outside the course for the purpose of this study. Completion or noncompletion of the data-collection instruments did not impact the preservice teachers’ grades, and they were informed that their responses to the survey items would be anonymous and used to make improvements to the simulation. The simulation platform is an HTML-enabled web link that the preservice teachers accessed using a unique login and password. After successfully logging in, they were immediately directed to a 2-minute Adobe Flash presentation/overview introducing them to the simulation and providing basic instructions on its use. After watching the overview, preservice teachers had five tab options to select (see Figure 2). The first tab, “Student Profiles,” provided the preservice teachers with the names, photographs, and biographies of the students in their classes. Preservice teachers were encouraged to review the student profiles to become familiar with the fictional students with whom they would be interacting, as a classroom teacher would review student files prior to the start of the school year. Figure 2. 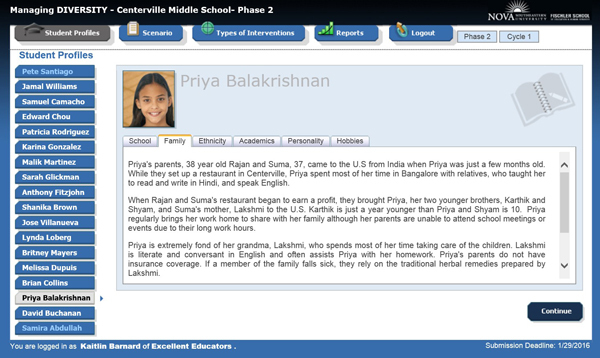 Screenshot of tabs and student profile. The second tab, “Scenario,” provided the preservice teachers with the specific scenario for each week. The scenarios were composed of detailed classroom or school-related issues that teachers frequently need to address. These scenarios were based on current events or actual situations that have occurred in various school settings. The third tab, “Types of Interventions,” provided 10 standard interventions for the preservice teacher to select to address the weekly scenario. The teachers were asked to review the 10 possible interventions and select the one that best addressed the issue presented in the scenario. Figure 3 displays the intervention choices. If the preservice teachers expressed that the interventions did not adequately address the issue in the scenario, they were encouraged to provide a custom intervention. Figure 4 is a screenshot that displays the custom intervention view. Figure 4. Screenshot of the custom intervention view. The next tab, “Reports,” provided the preservice teachers with the simulation response based on the intervention they selected. If the preservice teachers selected a custom intervention, there was no automated simulation response; hence, the response was provided by the instructor. The last tab, “Logout,” simply provided an option for preservice teachers to log out of the simulation platform. To complete the diversity simulation, preservice teachers were placed in three distinct simulated settings: a kindergarten classroom, a middle school classroom, and a high school classroom. They were presented with detailed information relating to the students in their simulated classrooms: academic history, hobbies, family dynamics, and student’s photo. As the simulation progressed from kindergarten to middle school to high school, the simulation classroom students remained relatively stable, but changes occurred relating to the family dynamics and academic performance. These changes were presented to the preservice teachers along with updated student profiles and photos to accommodate the age progression. This diversity simulation required all candidates to experience diversity scenarios at all levels (K-12). Candidates majoring in elementary education, for instance, were encouraged to offer their leadership and expertise to candidates of other majors. Likewise, secondary education majors offered their knowledge and expertise to candidates of other majors while reviewing high school level scenarios. Next, preservice teachers were presented with a detailed scenario that described a realistic diversity-related classroom/school issue. After reading the detailed scenario, they were presented with several possible interventions that could be used to address the scenario. Working in teams (along with other preservice teachers enrolled in the class) organized by the course instructor, they were asked to select the intervention they believed best diffused the issue in the scenario. If the preservice teachers as a team determined the interventions were inappropriate or inadequate, they developed their own custom intervention to address the specific issue described in the scenario. A new team leader was appointed each week who was responsible for discussing the scenario with his or her team, coming to a consensus and selecting one of the possible 10 interventions (or custom intervention) and uploading it into the simulation web-based program. The following week, the simulation instructor conducted a synchronous online chat with the preservice teachers. Team leaders were asked to present on behalf of their team to discuss their reaction to the scenario in addition to their rationale for selecting their intervention (standard intervention or custom intervention) and their team members’ roles and responsibilities. This study utilized a mixed-methods research design. This approach, as discussed by Onwuegbuzie and Leech (2006), is advantageous when both quantitative and qualitative data a+re used in a single study. Creswell (1995) indicated that mixed methodology designs signify “the highest degree of mixing paradigms….The researcher could mix aspects of the qualitative and quantitative paradigm at all or many steps” (pp. 177-178). More specifically, a parallel/simultaneous mixed-methods design (Tashakkori & Teddlie, 1998) was utilized. Participating preservice teachers completed the survey (quantitative data) and the essay (qualitative data) at the completion of the diversity simulation. In a separate study, Rayner and Fluck (2014) employed this approach to summarize their findings on a study relating to preservice teachers’ interactions with simSchool. Additionally, Badiee and Kaufman (2015) analyzed both qualitative and quantitative data to evaluate the overall effectiveness of simSchool in a preservice teacher education program. Thus, a mixed-methods research design was considered to best represent this study’s findings. In order to collect quantitative data, we administered a survey that preservice teachers completed during the final week of the diversity simulation. This online survey contained a few general questions (e.g., major, year started the program) and then focused on more specific questions relating to the overall diversity simulation and the level of the preservice teachers’ engagement in the course. The items were structured in a 5-point Likert scale (strongly disagree, disagree, neutral, agree, strongly agree). The survey items were initially developed by members of the simulation committee and pretested with the first group of preservice teachers who completed the course. Additionally, the original survey was distributed to six other full-time faculty members in the department for review. The original survey contained 25 items (plus six demographic-related items). After review of the collected data and comments from faculty members, six survey items were removed because they were considered either confusing or not directly related to the diversity simulation. Thus, the final revision contained 19 Likert-scale items along with general demographic items. Preservice teachers logged onto the Opinio survey link (provided in the syllabus) to complete the simulation survey. 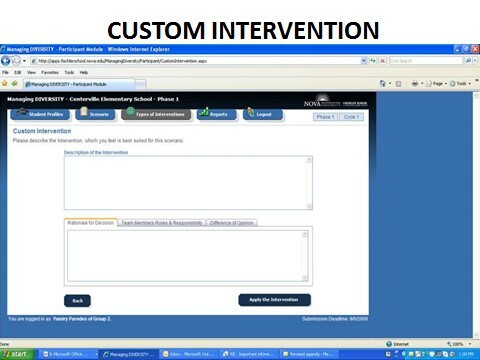 To prevent missing or unanswered items, a forced-completion method was implemented, in which preservice teachers were required to answer each item prior to submitting their responses. Completed survey responses were downloaded in a spreadsheet format, and the responses were printed and entered into the Statistics Package for the Social Sciences (SPSS) Version 19 (IBM Corporation, 2010). Data entry was double checked to ensure accuracy. Additionally, following data entry, frequency statistics were compiled, printed, and compared to the original data to further ensure data-entry accuracy. Results of these data are presented in the results section. The qualitative data centered on preservice teachers’ completion of an essay reflecting their experiences in the simulation. This assignment required them to prepare a 300-word simulation experience critique paper summarizing their entire experience with the diversity simulation, the relevance of the scenarios used for each simulation, and what they learned from this experience. This component was also completed during the final week of the course. This essay served as a means for the simulation instructor to collect qualitative feedback relating to the overall diversity simulation. The qualitative essays also were not part of the preservice teachers’ final grade. To analyze the qualitative data, an inductive approach (Miles & Huberman, 1994) was employed. We independently read responses to the essay several times. Based on the content, themes were identified by and, after discussion, either agreed upon (by consensus of all authors) or discarded (if consensus was not obtained). The data reported in this article reflect the academic terms for a 3-year period from fall of Year 1 through summer of Year 3 of the simulation study. Of the 193 preservice teachers enrolled in the course, 164 completed the survey for the combined terms, yielding a return rate of 84.9%. Their specific majors included elementary education (44.5%), exceptional student education (23.2%), prekindergarten primary education (12.8%), secondary math education (10.4%), secondary biology education (3.7%), secondary social studies education (2.4%), secondary English education (1.2%), middle school science education (1.2%), and middle school English education (0.6%). To assure anonymity, those who responded were not asked to provide their names, unique student ID numbers, gender, or ethnicity. Table 1 represents the frequency/percentage data of those who responded for each term. In addressing the first research question, we decided to ascertain if the scenarios presented in the simulation were seen as being realistic and could possibly occur in a real classroom. Additionally, we wanted to determine what approaches the preservice teachers used to address the issue at hand and how they came to a decision on a resolution to the specific issue. A selected sample of the survey results is presented. Because the scenarios presented in this study were inspired by current events, the preservice teachers were asked if the simulation scenarios mirrored real-life experiences. For this survey item, 90.2% responded agree or strongly agree. Thus, preservice teachers believed that the events presented in the simulation could occur in a real school. Several survey items focused on how the preservice teachers came to a decision regarding the issue presented to them. One survey item asked whether they thought carefully about the problem presented prior to recommending an intervention; 95% either agreed or strongly agreed with this item. Next, preservice teachers were asked if they evaluated each intervention to determine whether it was the best approach to dealing with the issue presented; 95.1% agreed or strongly agreed. Finally, preservice teachers were asked if they used problem-solving skills during the simulation; 93.9% agreed or strongly agreed. When looking at creative approaches used to address the scenarios, 94.5% agreed or strongly agreed that they tried to devise a creative approach to address the classroom issue. In addressing collaboration, 90.2% agreed or strongly agreed that they used team-building skills during the simulation. Table 2 represents a summary of the survey data. Additional statistics applied to the survey data revealed that no statistically significant differences were found between the preservice teachers’ majors and survey responses. Thus, elementary education majors, for example, did not respond differently from preservice teachers from other academic majors. Of the 120 submitted essays (response rate = 62.1%), we randomly selected three from each term, totaling 24 essays. Based on the analysis approach described in the research design section, the following themes emerged: self-efficacy, emerging professional identity as an educator, empathy, leadership, knowledge base, collaboration, ethics, and critical thinking. The most representative comments are presented in a detailed summary of the themes. Self-Efficacy. The first theme that emerged from the data was that of self-efficacy. The diversity simulation was designed to prepare preservice teachers to make critical decisions during their student-teaching internship and, ultimately, within their profession. Their beliefs in their ability to handle challenging situations are essential to this success. One preservice teacher, Student SELF1, appeared to be more confident after an experience navigating through the diversity simulation and interacting with classmates. The theme of self-efficacy ties in to Research Question 1. Gaining self-efficacy and confidence when faced with critical decisions in the classroom is an excellent preparation tool for future teachers. The characteristics and qualities of self-efficacy are needed to build self-confidence and motivation for first year and continuing teachers. I liked the format of this simulation. Being able to discuss topics with my peers allowed me to develop my communication skills as well as team building skills and solving the task at hand with each scenario. However, I would suggest a slight modification to the simulation by one, adding more scenarios, and two, incorporating some current event issues (Student SELF1). This EDUC 4200 Simulation Experience-Diversity course by far has been the most beneficial course I have taken at X. This course actually teaches us future educators how to deal with real-life situations that we may encounter in our teaching career. It puts us in a predicament to use good judgment for the situation and what will be the best outcome for all who is involve in the incident (Student SELF2). Emerging Professional Identity. The second theme identified was emerging professional identity. One of the goals of the undergraduate teacher education program is to provide quality state and nationally approved teacher-preparation programs that incorporate contemporary philosophies and best practices of teacher preparation. To accomplish this, the faculty strives to ensure that the preservice teachers are continuous learners and incorporate research for ongoing professional development. A critical objective is to develop the preservice teachers’ professional identity as an educator. The earlier the preservice teachers’ professional identities emerge, the sooner they can identify with the teaching profession and the students they will serve. Many preservice teachers solidify their professional identity during their first field experience, usually in the sophomore or junior year of college (if in an undergraduate teacher education program). This diversity simulation provided a simulated teaching experience connected with the theoretical practices to directly impact preservice teachers’ professional identity. Empathy. Empathy was an additional theme that emerged from review of the data, and it also addresses Research Question 1. What makes this theme unique is that empathy is usually implied within teacher preparation and demonstrated and learned more in practice than in theory. Empathy is not identified as a direct requirement within most state-approved teacher preparation programs pertaining to lesson plans, assignments, and textbooks, nor was it expected or assumed that there would be an emergence of empathy within a digital simulation, due to the separation of learner and instructor within the distance education course, in addition to the fictitious characters and profiles which comprised the students in the classroom. The review and evaluation of qualitative feedback collected from the preservice teachers rendered numerous examples of statements demonstrating the understanding of empathy as a result of their experience in the diversity simulation. Student EMP1 referenced growing up within an empathetic family background. Nevertheless, having a good foundation with an empathetic background may not be enough to respond effectively to critical situations, as addressed by Research Question 1, as the feedback from Student EMP1 and Student EMP3 illustrates. Additionally, Student EMP2 emphasized the critical nature of addressing issues related to bullying in the classroom and how important it is to support the victims of bullying. Some team leaders reported challenges, however, in leading their groups and obtaining consensus, as various members of their groups expressed different opinions. Student LEAD3 acknowledged the challenging aspects involved with serving as a team leader and identified aspects of leadership as it relates to this simulation. Collaboration. Preservice teachers should engage as part of a community of learners by the time they graduate and enter the classroom as professional educators, which can be modeled by cooperative learning, working in groups, and placing emphasis on working in team environments. A theme along these lines as evidenced within the qualitative data was collaboration. Preservice teachers were placed in teams consisting of five to six students at the beginning of the term. Many preservice teachers in this study acknowledged the improvement of their confidence as they worked extensively with their team members and, as a result, developed a strong sense of collegiality. In the following quote, Student COLL1 discussed the significance of teamwork and its effect on the diversity simulation. Although at first Student COLL1 was nervous, a collaborative bond was developed over time, culminating in a feeling that team members “…were supposed to be together.” This feeling is precisely what education faculty wanted to instill in preservice teachers, as collaboration is an essential component of the teaching profession. I really enjoyed working with my team. It seems like we were supposed to be together. I don’t know how that happened at all. We really had a good time building off each other’s ideas and supporting each other. This became more fun as the weeks progressed. At first we were focused on trying to do the right thing and a little nervous. However, as time went on we relaxed, settled in, and really enjoyed the course. Research Question 1 was also addressed by Student COLL1, who acknowledged that as a result of the diversity simulation, he would bring sharper skills into the classroom when he works in the future on teams with other teachers to support larger goals for his school and students. Many preservice teachers who participated in the diversity simulation did not immediately embrace the group/team oriented structure of the course and for a variety of reasons. Student COLL2 and Student COLL3 alluded to the initial disinterest in group work based on past experiences and the subsequent acceptance of this model as the course continued to move forward with positive results gained from the teamwork. Student ETH2’s statement accentuated the importance of working together with other educators to troubleshoot solutions to issues in the classroom rather than acting alone. Many times seeking guidance or input from other peers is important when making decisions, and the preservice teachers enrolled in this course began to acknowledge this fact. Additionally, Student ETH3 discussed the importance of differentiating consequences for students at different grade levels causing the same infraction. Critical Thinking. Critical thinking was also identified as an emergent theme. One of the values and beliefs of the undergraduate teacher education faculty included having the preservice teachers think conceptually and critically so that they make effective decisions in the classroom and display effective professional judgment. The impetus behind the diversity simulation focused on stimulating and thought-provoking scenarios and applying critical thinking skills to resolve challenging issues. The intervention selected by the preservice teachers invoked an outcome, and the scenario played out so the preservice teachers understood how the decisions they make affect themselves and others. Student CRIT1 appreciated the exercises fostering critical thinking and credited mentors with teaching the foundation for these skills. Additionally, the significance of learning to work with students of differing grade and age levels was stressed. I love being able to think outside the box. It’s not a skill that a lot of people have, but I have had so many mentors who do just that, so through the years my knowledge and ability to use abstract thinking has grown. The only thing is, I have become so accustomed to working predominantly in Special Education elementary classrooms, so it was nice to have discussions about middle and high school students. Additionally, Student CRIT 2 and Student CRIT 3 provided a reference to the knowledge gained and appreciation of the critical thinking and problem solving they used to navigate through this course. Knowledge Base. Knowledge base was the last theme identified. In addition to the student profiles, scenarios, interventions, and outcomes, this diversity simulation taught various levels of content related to classroom management, following the proper communication protocol when working with school administration, making the connection to attitudes and behaviors, and reacting properly to situations related to diversity both inside and outside of the classroom. Successful preservice teachers should learn not only to manage the classroom effectively but also to create a positive and safe learning environment. Student KNOW1 indicated that there is a protocol in the school that should be followed, as well as the necessity to collaborate with peers to reach a desired outcome for the student. Student KNOW2 made the connection between attitudes and behaviors, and Student KNOW3 stipulated a strong awareness of the families of students encouraging negative thinking. The findings indicate that the preservice teachers were able to articulate their perception of the information learned effectively as a result of completing the simulation successfully. The preservice teachers acknowledged that strengths in leadership, problem solving, and critical thinking enhanced their judgment and overall performance both inside and outside of the classroom. The preservice teachers’ preparation to enter the classroom was strengthened by the diversity simulation, as they envisioned themselves as professional teachers with the associated responsibilities and values. A potential limitation of this study concerns the survey data and the truthfulness of the respondents when completing the survey questions. To address this issue, the preservice teachers were assured anonymity and were reminded that their responses to the survey items were not reflected in the pass/fail grade for the course. They were not asked to identify their gender or ethnicity when responding to the survey items. Thus, there was little reason for them to provide information that was not truthful. However, as these demographic data were not collected as part of the survey, separate analyses could not be compiled. The second potential challenge relates to the fact that this study was based entirely on a simulation. The ways preservice teachers respond to an incident in a simulated classroom may not reflect the ways they would respond to a real-life incident. Finally, the participants for this study were undergraduate teacher education students who registered for a specific college course. The ways they responded to the scenarios and the quantitative and qualitative items may not be representative of how others would respond. We investigated the effectiveness of a simulated environment and its impact on the development of preservice teachers enrolled in an undergraduate teacher education program. Review of both the quantitative and qualitative data indicated that preservice teachers rated the simulation as a valuable part of their program. As Sottile and Brozik (2004) noted, “Well-designed simulations and games have been shown to improve decision-making and critical thinking skills” (p. 2). We found the same results; preservice teachers reported that the simulations required the use of critical thinking and problem solving skills. Preservice teachers described feeling comfortable in the simulated environment because they were aware that the decisions they made would not have a negative impact on students. As such, they replied that they felt safe in the diversity simulation with the ability to experiment and learn without the effects of real-life consequences. Girod and Girod (2008) noted that the fictitious K-12 students who composed the classroom environment within the simulation will never be harmed by decisions made by the teacher candidates, as they are part of a safe setting. As Badiee and Kaufman (2014) indicated, a simulated environment provides a platform for preservice teachers to make critical classroom decisions without experiencing the consequences that might occur in a real classroom environment. Despite being in a safe environment within the diversity simulation, preservice teachers did not express any prejudices or preconceived opinions about the various cultural backgrounds and differences represented in the simulation. Preservice teachers reported that they could improve from the feedback received and apply this feedback in a real classroom setting. In addition to the curriculum content and instruction provided during the diversity simulation, the technology used to develop the simulation platform should be credited with providing a realistic and authentic experience for the preservice teachers. In the current study, the preservice teachers reported that their overall experience mirrored real-life classrooms. This finding is consistent with Badiee and Kaufman (2014) and Girod and Girod (2008), who identified technology’s role in preservice teachers’ professional growth. Preservice teachers learned how to moderate discussion questions in an online environment by serving as the weekly team leader for a scenario. Similarly, Carrington et al. (2011) reported that teacher preparation is a continual process in which preservice teachers learn to modify their roles to be more effective as developing teachers. Preservice teachers also gained knowledge about communication and protocol needed to be successful within a school setting by strengthening their professional identity as future educators. Carrington et al. noted the traditional understanding that preservice teachers will cultivate their professional identity through their curriculum (theory) and field experiences (practice). A problem is that many preservice teachers are unable to recall theoretical knowledge from their textbooks, and simple observation in classrooms via field experiences may not be enough practice to develop their professional identity. Carrington et al. further suggested that the interpretation and reinterpretation of life experiences coupled with a deep understanding of the theory cultivate the professional identity of a preservice teacher. Participation in this virtual simulation impacted the shaping of preservice teachers’ professional identity. They learned the importance of selecting and executing proper disciplinary actions, handling situations in a professional manner, and communicating effectively. Preservice teachers also experienced feelings of empathy pertaining to the backgrounds of their simulation students and critical issues faced in the classroom, such as bullying. They developed collaborative and team-building skills, as they were responsible for communicating with their team members on a weekly basis via discussions and synchronous chats. This result supports the findings of Simkins and Steinkuehler (2008) and Bachen et al. (2012), that digital simulation and games are excellent forms of media to strengthen feelings of empathy through experiential learning and role-playing. Additionally, similar to the findings of Sottile and Brozik (2004) and Mason et al. (2012), preservice teachers in this study demonstrated knowledge about ethics as they selected effective, ethical interventions in challenging scenarios. This study has several implications. The first is that it adds to the findings of previous research that a simulation is a viable medium for preservice teachers to practice and reflect in a relatively consequence-free environment before assuming responsibilities in a live classroom. Both Badiee and Kaufman (2014) and Girod and Girod (2008) found that teacher candidates experienced success within protected settings that emphasize the significance of practice and reflection. Furthermore, the necessity of reflection is critical to the development of teacher candidates as they prepare for their professional careers. The foundation of the diversity simulation revolves around continuous opportunities for teacher candidates to reflect on their decisions throughout their experience in the course. As a result of these particular reflections, teacher candidates develop their professional skill sets and leadership qualities that they will subsequently bring into the classroom as better prepared and advanced professional educators. A second implication of the study concerns the choice of simulations for teacher education programs. Such programs may choose to use previously developed simulations, such as those discussed by Badiee and Kaufman (2014), Carrington et al. (2011), and Girod and Girod (2008). Teacher education programs may also opt to create their own simulations drawing upon the expertise of the faculty, as was the case in this study. Because this study and previous research found both commercially available and in-house simulations to be relevant and helpful in the development of teacher candidates, teacher education programs may opt for both types of simulations, as they are not mutually exclusive. Third, this study incorporates the use technology in an undergraduate teacher education program. The simulation platform was used to introduce preservice teachers to real-life scenarios and have them address key issues in the scenarios online. The concept of using technology to prepare future teachers is not new but is becoming more refined (Badiee & Kaufman, 2015; Rayner & Fluck, 2014) as technological innovations advance and the demand for online programs increase. Thus, with advances in technology, teacher education programs can refine and remold their curriculum to include the use of simulations in their programs. One way to revise the curriculum would be to include simulations throughout a teacher education program instead of relegating a simulation to a penultimate experience before an internship. Perhaps one of the most surprising findings of the study was that we found no emergent qualitative theme on diversity itself. Scenarios ranged from potential discrimination against a Muslim student, English language learners, and students from the LGBT community, and student profiles included Hispanic, African-American, Native American and South Asian backgrounds. There may have been a number of reasons why diversity did not emerge. First, the participants attended a minority-majority university and had nearly completed their undergraduate studies in this environment. Second, the participants’ teacher education programs were infused with cultural awareness of difference from the introductory crosscultural studies course they would take their first semester through their last English as a second language course they took just before participating in the simulation. Finally, diversity is arguably an established fact in the lives of the participants and should be promoted and celebrated in society whether they are teachers or not. The diversity simulation was included as a required, nontraditional, online capstone experience for preservice teachers prior to their student-teaching internship in order to prepare them for diverse, realistic situations with K-12 students and families, their teaching colleagues, and school administrators. Although the undergraduate preservice teachers consistently indicated that the scenarios were realistic and helped prepare them for future teaching, this study did not follow the preservice teachers through their internships or into the first few formative years of teaching. Future research on the use of diversity simulations, including design-based research, should include follow-up data collection and input from recent graduates and new teachers. Such an addition would provide simulation creators feedback on the realism of the scenarios and afford new teachers the opportunity to suggest new scenarios and interventions to strengthen the simulation’s ability to prepare for the ever-changing diversity in schools. Archambault, L., Wetzel, K., Foulger, T. S., & Williams, M. K. (2010). Professional development 2.0: Transforming teacher education pedagogy with 21st century tools. Journal of Digital Learning in Teacher Education, 27(1), 4-11. Bachen, C., Hernandez-Ramos, P., & Raphael, C. (2012). Simulating REAL LIVES: Promoting global empathy and interest in learning through simulation games. Simulation & Gaming, 43(4), 437-460. Gibson, D. (2007). simSchool and the conceptual assessment framework. In D. Gibson, C. Aldrich & M. Prensky (Eds.). Games and simulations in online learning. Hershey, PA: Ideas Group. Gibson, D., Aldrich, C., & Prensky, M. (Eds.). (2007). Games and simulations in online learning. Hershey, PA: Ideas Group. Inglis, S., Sammon, S., Justice, C., Cuneo, C., Miller, S., Rice, J., Roy, D., & Warry, W. (2004). Cross-cultural simulation to advance student inquiry. Simulation & Gaming, 35(4), 476-487. Ioannou, A., Brown, S. Gehlbach, H., Boyer, M., Niv-Solomon, A., & Janik, L. (2006). The GlobalEd Project: A study of self-efficacy and learning in a multimedia enhanced problem based learning environment. Paper presented at the 36th Northeastern Educational Research Association Conference, Kerhonkson, NY. Kervin, L., Ferry, B. & Carrington, L. (2006). ClassSim: Preparing tomorrows teachers for classroom reality. In C. Crawford, C. Carlsen, K. McFerrin, J. Price, R. Weber & D. Willis (Eds. ), Society for Information Technology & Teacher Education Conference (pp. 3204-3211). Chesapeake VA: Association for the Advancement of Computing in Education. Mason, L., Glomb, N., & Blair, P. (2012). How virtual learning environments function to simulate IEP team meetings in a distance teacher education program. In P. Resta (Ed. ), Proceedings of Society for Information Technology & Teacher Education International Conference (pp. 630-635). Miles, M. B., & Huberman, A. M. (1994). Qualitative data analysis I (2nd ed.). Thousand Oaks, CA: Sage. Onwuegbuzie, A. J., & Leech, N. L. (2006). Linking research questions to mixed methods data analysis procedures. The Qualitative Report, 11, 474-498. Rutten, N., van Joolingen, W., & van der Veen, J. (2012). The learning effects of computer simulations in science education. Computers in Education, 58(1), 136-153. Tashakkori, A., & Teddlie, C. (1998). Mixed methodology; Combining qualitative and quantitative approaches. Thousand Oaks, CA: Sage.